One time, I bought some really nice couch pillow covers from Pottery Barn. They are the shade of sunset orange, with huge turtle shell buttons. Now, the buttons are in constant danger. There is a small person who is obsessed. Obsessed with eating the buttons off of the pillows. So far, the pillows have escaped the untimely demise that would come from the small but strong teeth that belong to Sheldon. I have been vigilant. I forgot about my two year old and his impulse control issues. 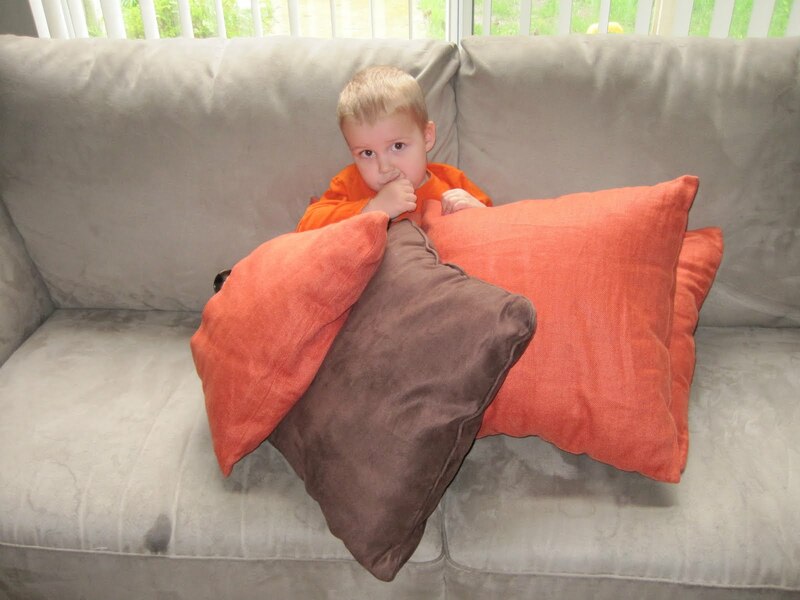 Orange Pillow Bravo…(there are four pillows total, and I have just decided to name them Alpha, Bravo, Checkmate, and Ranger Doug)…anyway, Orange Pillow Bravo has lost it’s button. Q yanked it off a while ago. It may have been months ago. It was a sad day. I write about this now because, I had planned on fixing the pillow LONG AGO. Now, I am starting to fear that Orange Pillow Bravo will forever be button-less due to my lack of motivation and my lack of sewing skills. Since I like to blog about the concrete and forever things in life, Orange Pillow Bravo sans button makes the cut. So funny! Those pillows look as big as him! This reminds me of the childrens book “Corduroy” by Don Freeman. It was my son Alex's favorite when he was two. It's a teddy bear in search of a button and a loving owner. Isn't there some law against children eating buttons? I think Pottery Barn better issue a recall of all those pillows. JoAnn, that picture of Q in the Buzz Lightyear costume cracks me up! I know the feeling, we just got a new table and Kayley took a fork to it. NOT cool. OH Corduroy! I need to go get that, I loved that book! Alexis, Kayley did WHAT? She's crazy! Thanks, it's how I amuse myself when I lose my social life due to sick kids…like the fish? I couldn't help myself..